NCDA Survey of Soybean Cyst Nematode in NC. Soybean cyst nematode is the plant-parasitic worm Heterodera glycines. 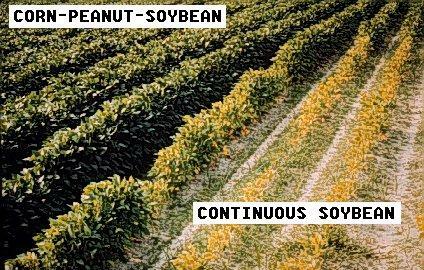 SCN can only reproduce on only a few hosts, such as soybean and snap bean, and SCN cannot reproduce on crops such as corn, cotton, peanut, tobacco or wheat (non-host crops). Eggs of soybean cyst nematodes are contained inside a cyst (the body of an adult female). The eggs are dormant during the winter, but from April through June, eggs hatch, and juvenile nematodes migrate through the soil. If the juveniles fail to locate roots of a host within a few weeks, they die. When soybeans are planted and start to germinate, roots exude substances that stimulate more hatch and attract juveniles to the root systems. Cyst juveniles penetrate the roots, migrating in the root until they locate a feeding site. This first event, penetration of the root system, may cause considerable damage to the soybean plant. As many as 10,000 cyst juveniles have been found in a single soybean root system as few as 10 days after planting. Nematode invasion of the root system frequently results in seedlings that are more susceptible to Phytophthora, Pythium, and Rhizoctonia root rots. Once the nematodes have established a feeding site in the root, they become stationary and induce nurse cells in the root. These nurse cells may prevent plant nutrients from reaching the shoots and leaves, sometimes causing nutrient deficiencies. More importantly, nutrients and water necessary for root growth are diverted to the nurse cells to feed the nematode. After the nematodes have established a feeding site, the cyst juveniles molt three times in developing toward adulthood in soybean roots. The female becomes lemon-shaped and males migrate from the root to fertilize the female. After fertilization, the body of the female breaks through the root. Eggs are produced by the cyst female and some are deposited in an egg mass outside the body of the female. These eggs, as well as eggs inside the female, will develop into second-stage juveniles that re-infect new plants. Females will generally mature (start producing eggs) in 21 to 28 days. 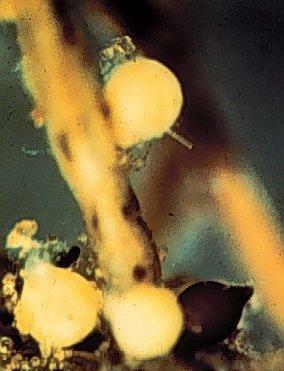 After 30-40 days, yellow cysts become brown as the female dies and becomes detached from the root system. The dead female body is the cyst stage which may contain 25 to 200 eggs. Many of these eggs in the cyst will remain dormant until the following spring. View through a microscope of white females of the soybean cyst nematode on soybean root (the long diagonal structure). Female is about the size of the head of a pin. The population density of soybean cyst nematode is relatively static during winter and early spring, but is changing constantly throughout the growing season. Eggs are dormant until March or April when juveniles begin to hatchm and hatching increases in May and June. Juveniles must penetrate the root system within a few weeks in order to survive. If soybean planting is delayed to mid- to late-June, the nematode density may be reduced significantly. Once soybeans are planted, the population starts to build up again until soil temperatures become very high in July or August. Reproduction resumes in September through October with the onset of cooler weather. In a given year, there may be 2 to 5 SCN generations produced. The number of generations (and the amount of infection next year) is largely determined by two factors: 1) the length of the growing season and 2) the environment during the growing season. A longer growing season, the length of which is primarily related to the soybean maturity group, will result in more generations and a higher population density next year. Group IV or V soybean varieties mature in September and October, whereas a group VII or VIII will not mature until late October or November. Late maturing soybean varieties allow for an extra generation of cyst nematode to develop, which generally doubles or triples the population density of this nematode. Additionally, early infection of soybean root systems by SCN causes the most serious damage to the root system. The primary determinant of soybean yield is the initial population density (or preplant population density) of SCN at planting. Later infections may cause additional yield loss and provide a reservoir for this pest to survive to infest the next soybean crop. Field populations of SCN have historically been characterized as races 1 through 16; however, these are now characterized as HG types. A race or HG type of cyst nematode is an indication of a field populations' ability to reproduce on a set of soybean varieties or breeding lines. These indicator lines are Peking, PI88788, PI90763, PI437654, PI209332, PI89772, and Cloud. Knowing the race/HG type of cyst nematode in a given field can assist in selecting resistant varieties. Unfortunately, many growers have relied on resistant varieties as a sole means of controlling this pest. Continued use of one resistant variety generally results in a change in the nematode population's ability to parasitize a resistant variety. For example, if a field originally has a population that is race 1 and grows the variety Forrest for 3 to 5 years, the population may shift from race 1 to race 2 or 4. A recent study by NCDA&CS and N.C. Cooperative Extension Agents of soybean cyst populations was conducted to determine the most abundant races in North Carolina. Of the 18 counties sampled in 2017, races 2 (87%), 4 (10%), and 5 (3%) were identified. More information about the survey can be found here: Soybean Cyst Nematodes in NC – Part 2. Soybean cyst nematode is often not evenly distributed within a field, and population "hot spots" can be seen throughout the field. This can lead to patches of stunted and chlorotic plants typically in elliptical-shaped patterns. Fewer fibrous roots may be observed when plants are removed from the soil. White to yellow lemon-shaped female nematodes can be seen without magnification around 30-40 days after planting. These female nematodes are about the size of a pen tip, much smaller than Rhizobium root nodules. Fewer Rhizobium nodulation has akso been associated with SCN infection. Sometimes there can be little to no visible above-ground symptoms beyond declining yields. In high levels of infestation, the tap root may be killed, 4 or 5 inches below the soil surface. Since all secondary soybean roots come off the tap root, the soybean root system can be severely limited. The stunted root system may not be evident until the plants are under moisture and/or nutrient stress. Affected plants may show moisture stress even though soil moisture is adequate below the root system. When high levels of infection occur, nodulation of the soybean root system is also inhibited, limiting the plant's ability to fix nitrogen causing plants to be light green or yellow. If diagnosis cannot be accomplished through visible signs and symptoms, soil samples can be taken and sent to North Carolina Department of Agriculture, Agronomic Services, Nematode Advisory and Diagnostic Lab, 4300 Reedy Creek Road, Raleigh, NC 27607. Nematode samples should be taken from 4-5 acre plots when attempting to diagnose large fields as nematode populations are not evenly distributed. Using a soil probe collect 20 to 30 soil cores at a depth of 6 to 8 inches from each area in a zigzag pattern. Place samples in a plastic bag and place in Nematode Assay box, which can be obtained from county extension agent. If samples cannot be sent within a few days store at a cool temperature. Soil and roots may also be sent to the Plant Disease & Insect clinic to be examined. The benefits of sending soil and root samples to the clinic is that other nematode and disease problems contributing to crop loss or damage can be identified. When sending samples include an accurate crop history, information about fertility, herbicides, and cultural practices to aid in diagnosis. This nematode can cause significant damages and yield losses. To mitigate these losses economically, an integrated management approach using multiple practices (described below) is recommended. Early infection of SCN causes the most severe damage to the root system. Much of the soybean’s yield potential is determined in the first 2-4 weeks after planting. Soybean maturity group determines the amount of reproduction in the Fall. Late maturing groups like VII and VIII which do not mature until late October or November allows an extra generation of SCN to develop. This extra generation can double or triple the population. Managing reproduction by using soybeans with an earlier maturity group can help reduce population numbers the following year. In SCN infested fields no-till farming practices may increase yields and suppress population densities after 3 years. It can also prevent mechanical movement by farm equipment so SCN is not spread throughout a field. When farm equipment is used in an infested field extra care should be taken to keep equipment clean when moving to a non-infested area. Crop rotation with non-host crops such as corn, cotton, tobacco, peanut or sorghum can be used to decrease SCN populations. Recommended rotations using resistant varieties can be found in Table 1 and in Table 2 when resistant varieties are unavailable. Some damage from SCN may be present using non-host rotations less than 3 years, however damages may be at tolerable levels. The use of resistant varieties can also be used to minimize reproduction. In order to prevent soybean cyst nematode resistance rotate through all resistant soybean varieties then plant 1 yr of susceptible variety before beginning cycle again. Resistant varieties can only be used effectively when matched with the correct SCN race. The continued use of the same resistant variety can lead to a race shift in the population. Few varieties have resistance to the races recently identified in North Carolina. Some of the varieties that have resistance to SCN races 2, 4 or 5 include: Fowler (1,2,3,5,14), Jake (1,2,3,5,14), JTN-5503 (2,3,5,14), N7003CN (1,2,3,4,5,14), Osage (2,3,14), and P52T86R (1,2,3,5,14). Chemical controls for SCN are often expensive and do not guarantee a positive yield response, and few nematicides are registered for use against SCN. The fumigant 1,3-dichloropropene (Telone) and other chemicals such as aldicarb and oxamyl can be used for SCN control. Seed treatments have shown some efficacy in managing yield losses when used in fields with low to moderate populations of SCN. Seed treatments may help soybean plants establish larger root volume, but provide a short window of efficacy since they treat a small volume of soil/roots. These should be used in conjunction with other management practices described above. Table 1. Suggested rotations for managing soybean cyst nematodes with resistant varieties. Table 2. Suggested rotations for managing soybean cyst nematode without resistant varieties. Effects of rotation on damage caused by soybean cyst nematode. For assistance with a specific problem, contact your local N.C. Cooperative Extension personnel. This factsheet was prepared by the NCSU Field Crops and Tobacco Pathology Lab in 2018.